I know that I am going post crazy (not to be confused with postal) but I need to document the things that are going on in our lives, and since normal journal writing is so hard for me, I get to bore you all with the intrinsic details of our lives. Lucky you! Today is a momentous day in the life of my son. 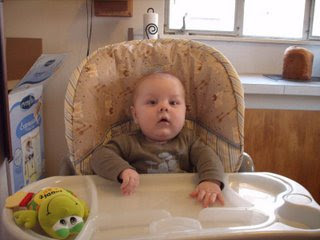 Today is the day he says good bye to the high chair. He has loathed it for so long. He hates being restricted and sometimes gets revenge on us for imprisoning him by making food art all over himself, the chair, and even (especially) the floor. We brought in his little table (which was actually our dinner table when we first got married) and he has taken quite a liking to it. He will spend hours... literally hours playing on his table. He draws, plays with his lap top, reads, and stays put long enough to eat a full meal. It is wonderful! So, goodbye dear high chair. You have served us well. Off to the shed with you, along with all the other outgrown baby things. Enjoy your rest until the next baby comes along. Enjoy being clean, and resting in one place rather than being carried to every room of the house, and kicked by your little captive. Enjoy it, because who knows how long you can rest before the next victim comes along and we need your skills again.